Since then, I’ve never gone anywhere else – well, there was that one mistake. A friend in Paris who frequents London knew I was scheduling a “I Know A Little Place” reconnaissance trip and said “You owe it to your readers to check where I stay; it’s listed among the chic boutique hotels, is centrally located, and offers a great value.” After one miserable night I phoned The Stafford and they graciously welcomed me back. I did it for you, dear readers, but never again. 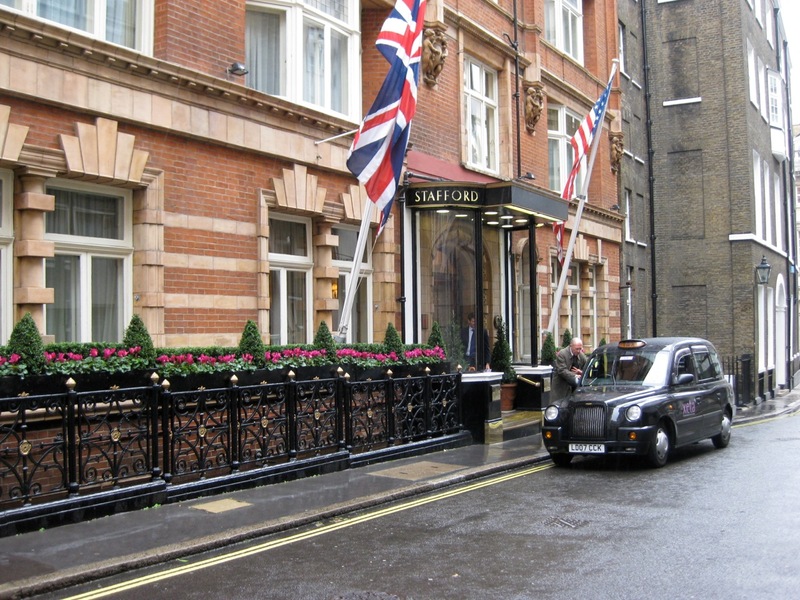 The Stafford describes itself as “Your residence whilst in London” but unless your home is a blend of traditional elegance and comfy charm, with people who anticipate your needs and desires before you are even aware of them and make you feel like their favorite celebrity, then The Stafford is better. I always follow the same schedule. After checking in, I head out in one of two directions. Exiting the front of the hotel, I take the little passage that opens to Green Park and the shopping pleasures of Piccadilly, including the Burlington Arcade and Old Bond Street. Equally tempting is the exit leading through the courtyard and the short walk to Jermyn Street. Either way, must stops are Fortnum & Mason to pick up treats to savor back in my room and a book or two from Hatchard’s. Examples of the staff’s commitment to their guests is demonstrated by the time I left my iPhone on the train the day before I was leaving the country. I should not have panicked; I was at the Stafford after all. They managed to retrieve it for me and send it on after I’d arrived home-– yes, they can perform miracles. London, as we all know, is an expensive city, compounded by the currency exchange rate, but what you expend in pounds at The Stafford will come back many times over in pleasure. Travel is for fun, carefree, away from the real world experiences, right? That’s true until you wind up in a hospital and the doctors trying to take care of you need vital information you don’t have. This nightmare became a reality some years ago when my husband developed what we thought could be a blood clot after a long flight. We raced to a French hospital and struggled with trying to supply doctors with useful information about his medical history. After exhaustive tests our fear turned out, mercifully, not to be the case, but it scared us into constructing portable medical files containing every scrap of information we thought we might need to provide should another emergency arise in the future. This has worked fine – and “yes” it’s been helpful on a number of occasions — although adding unwanted bulk to our paired down baggage. Having your emergency and medical information available for any doctors who may be called upon to treat you is not a precaution just for people who have complicated health situations, it’s for EVERYONE. It could save your life – don’t leave home without it.